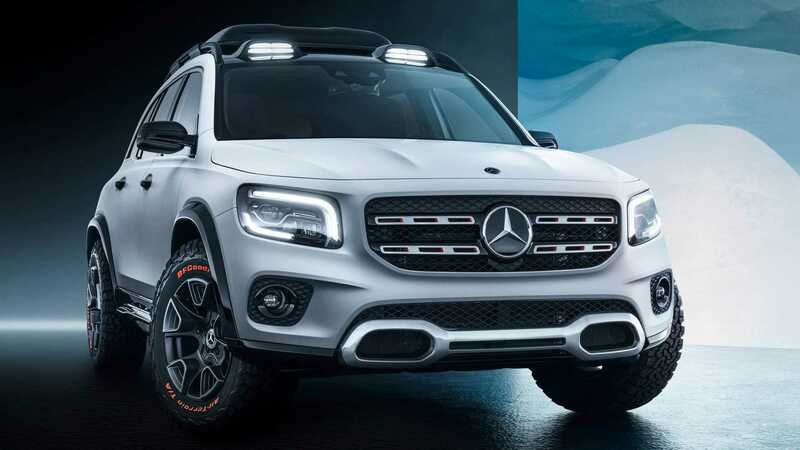 German car manufacturer Mercedes-Benz has started its 2019 Auto Shanghai program with the reveal of the Mercedes-Benz GLB, an SUV that looks like a downsized version of the Geländewagen. The car will enter mass production next year. Despite its modest dimensions, the new GLB manages to offer seven seats in three rows. It also comes with adaptive shock absorbers and air suspension. The concept car has short overhangs, numerous chrome details, 17-inch wheels, and several protective pads. There is also a roof-mounted light bar, but the company admits it is there for show and will not be available when the sales start. The interior trim of the Mercedes-Benz GLB involves nubuck leather, Nappa leather, and aluminum. There is a multi-function steering wheel and an ‘AI-powered’ MBUX infotainment system, which the company claims to be identical to that of the 4th-gen A-Class. Nm (258 lbft) of torque. The unit links to an AWD system and an eight-speed dual-clutch transmission. Once out, the car is going to have to stave off the competition of the BMW X1 and the Audi Q3.